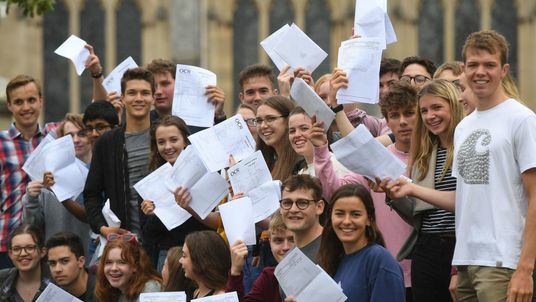 A-level students have been awarded the highest proportion of As and A*s since 2012, amid changes toughening the exams in England. Some 26.4% of exams have been awarded these top grades this year - but the proportion gaining A* to C dropped to 78.4% from 79% last year. England's exams regulator has said the results show a steady national picture at a time of significant change. Pupils in England, Wales and Northern Ireland are finding out their results. Overall, 97.6% of A-level entries were awarded A* to E grades. Examiners dismissed the rise in top grades as "extremely marginal", while Ofqual has underlined that results have remained steady.